We’ve written about WVSP on this blog before–it was the pioneering Warrenton station that mingled activism, journalism, and community development. But what did it play? Take a look. From Mr. James E. Robinson’s personal collection. 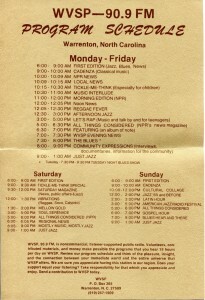 When he was seeking to form a relationship with NPR, they sent him a brochure introducing the network. 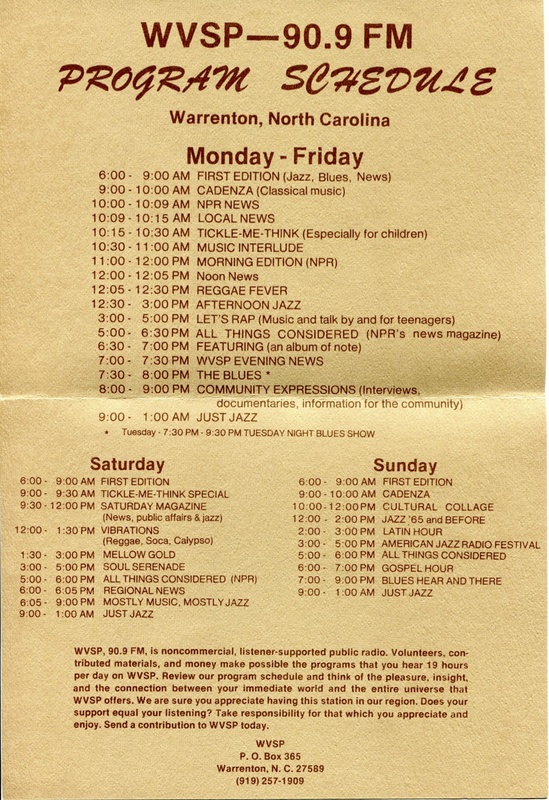 Note on the last page there are two NPR affiliates in North Carolina: WFDD in Winston-Salem, and WAFR in Durham, a community oriented station founded and run by African Americans at and affiliated with North Carolina Central University. Media and the Movement: Journalism, Civil Rights, and Black Power in the American South is an oral history project that aims to understand the media and activism ecosystem of the American South during the civil rights movement of the 1960s, 1970s, and 1980s. Media and the Movement: Journalism, Civil Rights, and Black Power in the American South is directed by Joshua Clark Davis, Ph.D. of Duke University and Seth Kotch, Ph.D. of the University of North Carolina’s Southern Oral History Program in the Center for the Study of the American South in collaboration with Charmaine McKissick-Melton, Ph.D., Associate Professor and Chair, Department of Mass Communication at North Carolina Central University and Jerry Gershenhorn, Ph.D., Professor of History at North Carolina Central University, and Jacquelyn Dowd Hall, Ph.D., Spruill Professor of History at the University of North Carolina. Interviews began in January of 2013. Additional project collaborators include Joey Fink of the University of North Carolina, Gordon Mantler, Ph.D., of Duke University, and Nicole Campbell of WUNC 91.5 North Carolina Public Radio and producer for The State of Things. We are grateful to the National Endowment for the Humanities and to the North Carolina Humanities Council for support. For more on this project, visit our About page.